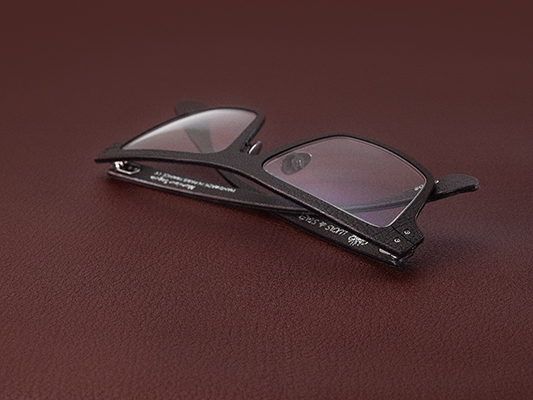 The Vivarium Edition dresses up the spectacles with exceptional exotic leathers: stingray, karung, iguana. Our exotic leathers are extremely resistant and don't require any maintenance. The stone can produce abrasive dust that might damage your lenses. Temples are adjustable both horizontally and vertically. Clean the lenses with a dry or slightly humidified cloth provided with your frame. Avoid any extended contact between the leather and water, cosmetic products or greasy substances. Do not expose your glasses to extreme temperatures. The cow leather frames will gain patina over time, the frames will be impacted by skin oil and acidity as well as UV’s. Temples are adjustable both horizontally and vertically. The allure and resilience of your leather frame will depend on the way you maintain it. The Minotaure spectacles are delivered with their own nurturing wax. Temples are adjustable both horizontally and vertically. The different colors of the goat leather collections are UV resistant; the leather will wear out with the passing of time.